In recent years we have seen an increasing number of multi-flowering paphiopedilums on the show bench as grower interest increases, due to the expanding range of colours and forms, and to their greater availability. This is not to say that multi-flowering paphiopedilums are new, because a century or so ago many of the early hybridisers produced some stunning and desirable crosses that are still grown and sought after today. 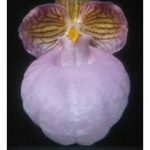 The resurgence in multi-flowering paphiopedilums follows the discovery of many new paphiopedilum species that provide colours and shapes previously unknown to the orchid grower. In particular, P. micranthum, P. armeniacum and P. malipoense from China and P. vietnamense, P. hangianum and better forms of P. delenatii from Vietnam, are unique finds that have already had a huge impact on hybridising. While the above are single flowering species, their crossing with multi-flowered forms aims to bring out the best of both parents. 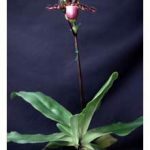 A recent catalogue from a local mail order orchid nursery lists around sixty new multi-flowering paphiopedilum hybrids for sale. 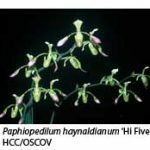 Similarly, a review of the orchid magazines for new orchid hybrid registrations, provided by the Royal Horticultural Society, indicates an expanding worldwide quest to develop new and improved paphiopedilum hybrids, many of these being multi-flowering. Although paphiopedilums may occasionally produce two or even more flowers on a scape, the true multi-flowering forms consistently produce either a sequence of flowers in which one flower is replaced by the next, or a number of flowers that open together to give a massed display. 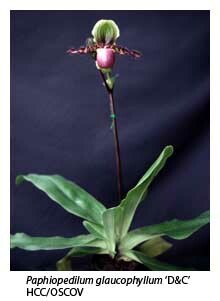 The sequential flowerers generally come from the Cochlopetalum Section of the genus Paphiopedilum, comprising P. glaucophyllum, P. liemianum, P. moquettianum, P. primulinum, P. victoria-mariae and P. victoria-regina (syn. P. chamberlainianum). While these species are rewarding to grow in their own right, the hybridisers have tended to concentrate on a few of these species for their desirable characteristics – for example, P. primulinum for its sequential yellow flowers, P. glaucophyllum and P. moquettianum for their shapely, colourful flowers, and the larger-flowered P. victoria-regina for flower size. Most of these sequentially flowering hybrids tend to be strong growers with attractive flowers; because of their sequential flowering habit, they may remain in flower for months at a time. 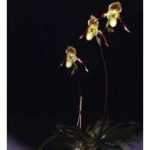 P. primulinum has been a parent to some of the more popular of these hybrids, including P. Honey (P. philippinense x P. primulinum), which was first registered in 1979 and remade many times since. P. Honey has yellow to green flowers with longer petals, taking after its P. philippinense parent. 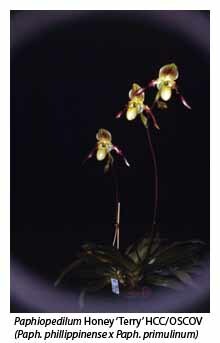 Other proven hybrids with P. primulinum as a parent include P. Primcolor (x P. concolor), P. Primechild (x P. rothschildianum), P. Elfin Charm (x P. fairrieanum), P. Mamie Wilson (x P. lowii) and P. Henrietta Fujuwara (x P. haynaldianum). In turn, many of these primary hybrids have also made good parents. Another attractive hybrid, created using two sequentially flowering species as parents, is P. Glaucoliem (P. moquettianum x P. liemianum). This primary hybrid has colourful and well-shaped flowers, some of the better clones having received OSCOV quality awards during the last few years. Mention was made earlier of some of the older crosses. Two such primary hybrids, made using a sequentially flowering species and a multi-flowering species as parents, are P. Transvaal (P. chamberlainianum x P. rothschildianum, registered in 1901), and P. Vanguard (P. glaucophyllum x P. rothschildianum, registered in 1921). Both produce excellent flowers that combine the best features of both parents. These two hybrids are worthwhile acquisitions, especially if you can obtain a division of an original plant; remakes are a good option but be warned that these crosses are slow growers so you will need to be patient until they eventually reach flowering size. 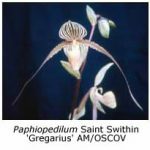 The range of multi-flowering paphiopedilums is much broader than the range of sequential types due to the relatively large number of multi-flowering species available for hybridising. Section Coryopedilum covers at least eleven species that include P. philippinense, P. sanderianum, P. stonei, P. kolopakingii, P. glanduliferum, P. gigantifolium, P. randsii, P. wilhelminae and P. rothschildianum, while Section Pardalopetalum includes P. haynaldianum, P. lowii, P. parishii and P. dianthum. 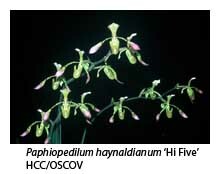 All of these species have been used to a greater or lesser extent in hybridising, with P. philippinense, P. stonei, P. rothschildianum, P. parishii and P. lowii appearing more frequently. While their more frequent use is partially a function of time and earlier availability, their specific characteristics of shape, size, colour and petal length, including their multi-flowering character, were desirable attributes to the hybridisers. P. rothschildianum was used extensively in early hybridisation to produce some wonderful primary hybrids, including P. A. de Lairesse (x P. curtisii, 1895), P. Rolfei (x P. bellatulum, 1901), P. St. Swithin (x P. philippinense, 1901) and P. Julius (x P. lowii, 1914). 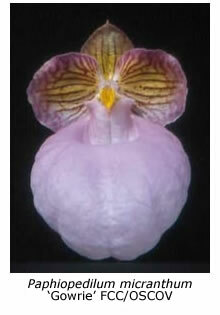 It was not until the late 1950s that additional sources of this species were found on Mt. Kinabalu and further hybridisation could commence. 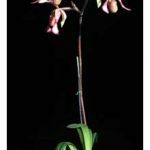 Most current nursery listings now provide many P. rothschildianum hybrids, including both the older types and many new crossings made with Chinese and Vietnamese species. 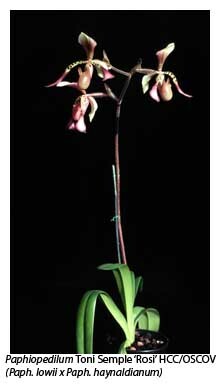 These new species promise wonderful multi-flowering hybrids with the additional benefit that the P. rothschildianum parent is an intermediate grower and does not require the higher temperatures necessary for some of the other species. However, as mentioned with both P. Vanguard and P. Transvaal, you may need to wait some time for these multi-flowering plants to reach flowering size. Some other successful multi-flowering crosses include P. Glaucopar (P. glaucophyllum x P. parishii), P. Angel Hair (P. St. Swithin x P. sanderianum), P. Harold Koopowitz (P. malipoense x P. rothschildianum), P. Prince Edward of York (P. rothschildianum x P. sanderianum), P. Mem. Rolf Bolin (P. glaucophyllum x P. superbiens), and P. Tony Semple (P. lowii x P. haynaldianum). There are many other multi-flowering crosses and, depending on your available space, you should try some. Most will grow into large plants and require extra space to ensure adequate light and air movement, and to accommodate the flower scape. I hang my plants in a light and airy position and avoid wetting their foliage during the cooler months. Some fertiliser is useful for these larger plants in the growing season but only if applied at half strength; flushing the pot regularly with water will help to reduce the build-up of salts in the mix. The main pests are mealy bugs, slugs, snails and seasonal grubs. Mealy bugs are difficult to eradicate as they hide away and their eggs remain viable for some time. A systemic spray is probably best but follow-up is essential a few weeks later. Be careful to protect emerging flowers as the spray can damage them. To control slugs and snails place some snail bait in the pot, even when it is suspended, as these pests seem to be able to find a way to a choice bud wherever the pot is located. The same applies to grubs – continual vigilance, followed by appropriate treatment, is essential.